The global licorice extracts market is estimated to experience a significant rise in the demand in the upcoming years. The competitive scenario is amrked by immense competition among the players. At present, the firms are concentrating on R&D activities so as to create new products to pacify the surging demand regarding sugar free activities. This is attributed to the increasing number of people suffering from obesity and diabetes. Major players working in the global licorice extracts market include Zelang Group, ASEH Licorice MFG & Exp. Co., SepidanOsareh Co., Zagros Licorice Co., Maruzen Pharmaceuticals Co. Ltd., F&C Licorice Ltd., and Norevo GmbH. According to a recent report by Transparency Market Research (TMR), the global licorice extracts market is prognosticated to expand at a steady CAGR of 4.0% within the forecast period from 2017 to 2025. In 2016, the market was valued around worth of US$1.70 bn and is foreseen to soar around US$2.3 bn by 2025. On the basis of application, the global licorice extracts market is segmented as tobacco, pharmaceuticals, and food and beverages. Among these, the market is dominated food and beverages sector and is likely to sustain its lead in coming years as well. Besides, the demand in tobacco segment is also witnessing a rise since past few years. This is owing to high usage of licorice extracts as sweetening-agent. 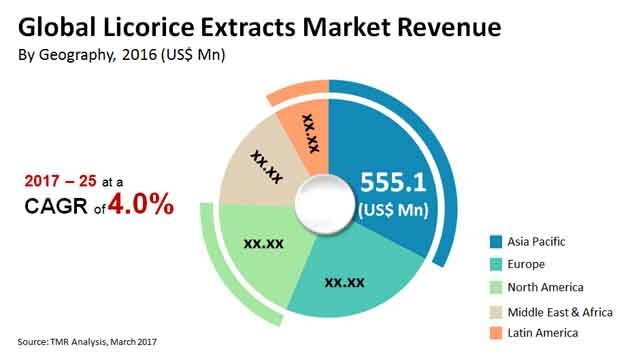 Propelled by India, Japan, and China, the global licorice extracts market was led by Asia Pacific region in 2016, as far as geography was concerned. It accounted for over 32%share of market. This region is likely to continue its dominance in the forecast period as well. The key factor that is adding to the improvement in licorice extracts market is increasing preference of the consumers for the products that are created utilizing organic ingredients, especially in developing economies. In the age of the home remedies and other natural items, the use of the licorice extricate is developing quickly. Licorice extracts has a couple of medicinal benefits, as a result of which the demand is augmenting all over the world. The factor that hampers the advancement of the licorice extracts market is the low availability of the crude materials which are, hence, increasing the expense of the licorice. In any case, the market has splendid growth opportunities with the rising demand of natural remedies in developed nations over the world. Due to its foaming properties, the licorice extracts is being used in various application in the market. This improves the quality and time range of ease of use of the froth. Consequently, these extracts are commonly used as a piece of the refreshment business as frothing pro. Even though there is still a huge section of therapeutics properties of licorice to be tested. Some of the benefits have been exhibited and others are enough help to warrant its usage in different supplements. It is usually found in teas and used as an ingredients in several food products as taste enhancer. The licorice extracts can also offer help with respect to stomach issues, for instance, indigestion. Owing to the above medical properties of the licorice extracts, there has been a flood in its usage in healthcare industry. This factor, along with rising odds of licorice extracts in treating cancer is foreseen to bolster the segment growth over the coming years. As a result of rising uses and increasing number of opportunities as for the use of licorice extracts by the pharmaceutical business is likely to boost the global licorice remove market in the forthcoming years.